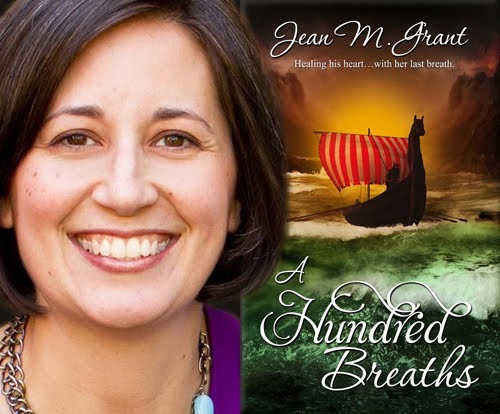 Today we have the pleasure of meeting up with author Jean M. Grant to talk about A Hundred Breaths (18 February 2019, The Wild Rose Press, Inc, 263 pages), an Historical Romance, book two in the A Hundred series. A very warm welcome to Jean M. Grant; thank you for joining us on BooksChatter! We love music; do you have a music playlist that you used in A Hundred Breaths, or which inspired you whilst you were writing it? "My play list mainly includes instrumental music. My go to album is Kerry Muzzey (with the London Chamber Orchestra)’s “The Architect.” For fun, my Pandora channel tosses in some other sweeping inspirational/film scores (Game of Thrones, The Road, or Last of the Mohicans, anyone?). This playlist is followed closely by Enya. If I am digging some words (usually while doing editing or promotion work) I have a playlist that includes Roy Orbison, Elvis Presley, Johnny Cash, and Patsy Cline. Toss in some Ed Sheeran and I’m good to go." What was the inspiration for A Hundred Breaths? "My first book inspired this book, the prequel. I’m also writing the third book to make this into a trilogy. I wrote the first book (A Hundred Kisses) with no intention of going beyond that unique story. However, Deirdre’s parents’ story spoke to me (those pesky characters like to get in my head. 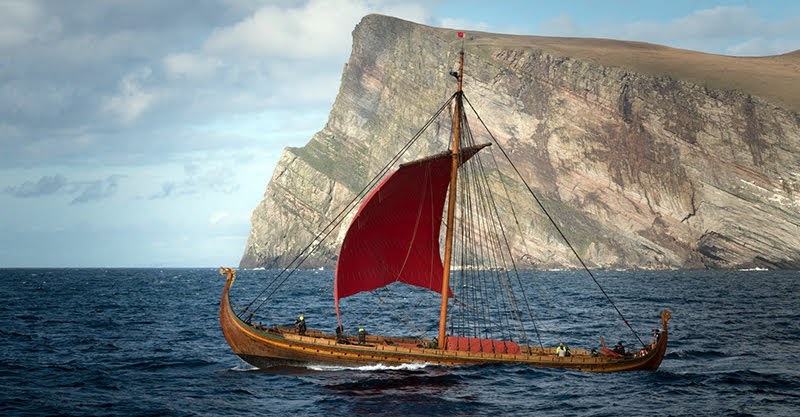 It turns out that 1263 was a pivotal year for the Norse and Scots…a final battle to end all battles. After creating Deirdre’s mystical Feeler ability in A Hundred Kisses, I knew that this was an inherited trait, and her mother should also have a gift. Turns out she was a Healer. And thus, A Hundred Breaths was born." "Some of my best ideas are based on real-life experiences. For my first book, that was a woman yearning to learn more from a mother she lost to death too soon, which parallels my own life. She wanted answers. I weave a bit of my own personality (the good, bad, and the ugly…) into all my characters. We’ll leave that mystery up to my readers. They do say the villain has to come from somewhere…Joking aside, I try to make well-rounded characters with flaws and strengths I’ve either experienced, read about, or have been inspired by." The first thing that draws me to a book is its cover. Can you tell us about your cover for A Hundred Breaths - why you chose that concept and who the artist is. "I’m visually-inspired and I love a cover that reflects the mood and setting of a book. I prefer to leave the image of the protagonists up to the reader (though I have my own vision in my mind!). 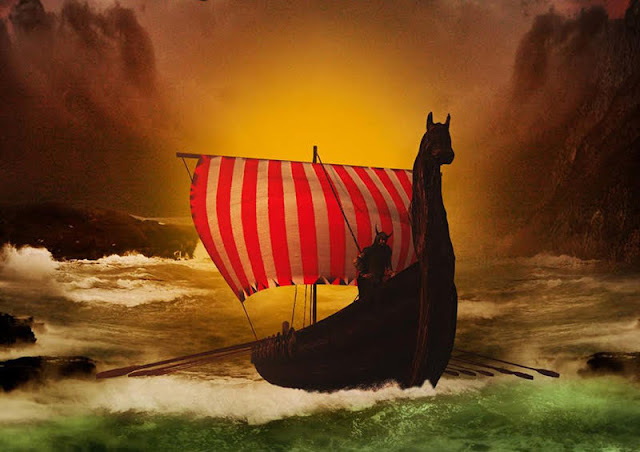 I delved into research of the Norse and was very eager to have a ship on the cover. Water is my heroine’s conduit for her Healing power, so the churning, vibrant, life-giving water on the cover is a perfect symbol for her special ability. But…though water heals and gives life, death also travels by water. The cover artist, Debbie Taylor, wrapped the mood up well with the hint of fire/conquering, rocky cliffs, and an approaching ship. Death is coming by sea. Do the Scots have the power to end it once and for all?" Why should we read A Hundred Breaths and what sets it apart from the rest? What makes your book unique? "Magic! Well, a mystical people of Ancients who have abilities to harness the earth’s elements of Fire, Water, and Wind. The stories of this soon-to-be trilogy are steeped in history (Scots, Norse, and English – what a trio they make! ), clashing religions and cultures, vivid imagery and resplendent landscapes (most that I’ve visited). Weaved within are stories of heart, redemption, healing, and forgiveness. Oh, and well, Happy ever-afters, of course." Can you tell us something quirky about A Hundred Breaths, its story and characters? "I named characters after family members in both this book and the first. Also, I took a nearby town and broke its name into two names for characters. 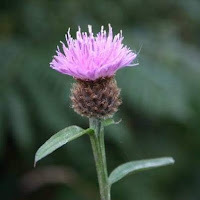 Something else—fate, maybe?—the editor at my press is not only from Scotland, but she hails from the isles and her last name is related to the clan in my book. I do not lie. Coincidence or fate? I’ll let you be the judge. She’s been asset, especially with making sure the Gaelic is correct." Who would you recommend A Hundred Breaths to and what should readers be aware of (any warnings or disclaimers)? "My inspirations twenty years ago when I began to dabble in writing were Julie Garwood and Diana Gabaldon (of Outlander fame). Anyone who enjoys historical Scottish/medieval romances with a paranormal twist would like these books (or I hope, right?). My heat rating is spicy, and the romances are slow burns. No opening racy scenes, but the couples do eventually consummate their unions. If readers enjoy sweeter romances, it can still be enjoyed…just skim over those later scenes. The setting is a time period of wars, so there is some bloodshed (but not at George R.R. Martin level)." If you could / wished to turn A Hundred Breaths and the A Hundred series into a movie, who would be your dream team? "Though I’ve had visions of the “who will play them” for my two contemporaries (both soon to be released), I’ve not yet considered the vision for A Hundred Breaths or the “hundred” trilogy for film. Now you’ve got something for me to ponder when I hit writer’s block. All I know is that the movie needs to be filmed in the historically accurate Scotland settings!" "My first love is romance, and I write both historical and contemporary. I’ve tossed in some paranormal elements in the historical and would like to explore that avenue more with other books. I also write contemporary women’s fiction. On the back-burner…maybe write a children’s book or two. I also write non-fiction travel magazine pieces. I read a range, usually adult, in romance, women’s fiction, mystery, and suspense." "I was born a plotter but over time I’ve allowed some pantsing to creep into my style. I used to define plot first, characters second. With honing, I’ve embraced a methodology where I have a vague story idea but I spend lengthy time developing the characters first: their backstories, emotional wounds, full characteristic sheets, etc. Oh yes, in chart form. I LOVE charts. I love research, and it applies to both historical and contemporary. I have a pile of books at my side and websites bookmarked. I also visit museums and landmarks, and travel to locales if possible. I visited Scotland ten years ago, and took good notes on Eilean Donan Castle, the isles, and Dryburgh Abbey. Recently, I was able to tour the Draken Harald Hårfagre, an authentic recreated Viking ship." "I have two more books releasing this spring (contemporary romance, contemporary Women’s Fiction). I’m also writing the third book in the “hundred” trilogy." "I love flowers. Not just love, but like, love. They are my happy place. Thistles are my author hallmark. I love day lilies and lupine, almost too much? 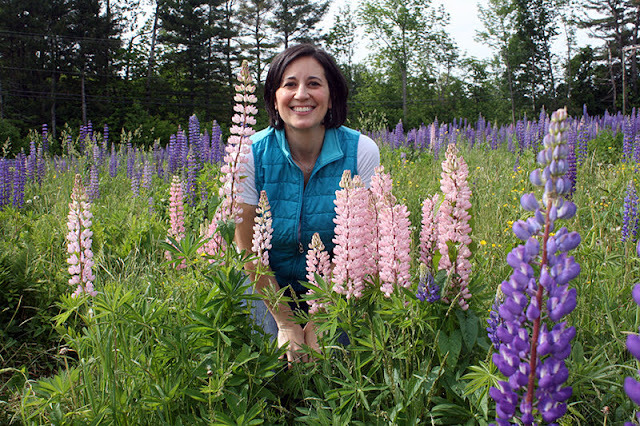 I talk to my perennial gardens in the spring to make sure they grow well for summer. I live in a place where it’s winter 6 months of the year, so summer is my Zen. One of my favorite places is Sugar Hill, New Hampshire. So here I am, among the lupine." Can she heal his heart... with her last breath? Blade meets healing hand in this historical romance laced with Norse warriors, a merciless Scot, and a mystical Silver Veil. I'm here all day/all week for answering questions! Happy to be here! Thanks again for hosting me. I'll pop back in through the week if anyone has questions. Enjoy all the photos! If I love one thing, it's scenery -- sweeping moors, gorgeous flowers, and craggy peaks -- and I enjoy lathering my stories in a rich backdrop.